Zoe Howard (USA) watches as her two-hand return shot heads back toward her opponent their opening qualifying match in the ResortQuest Pro Women’s Tennis Open at Sea Colony on Monday morning. 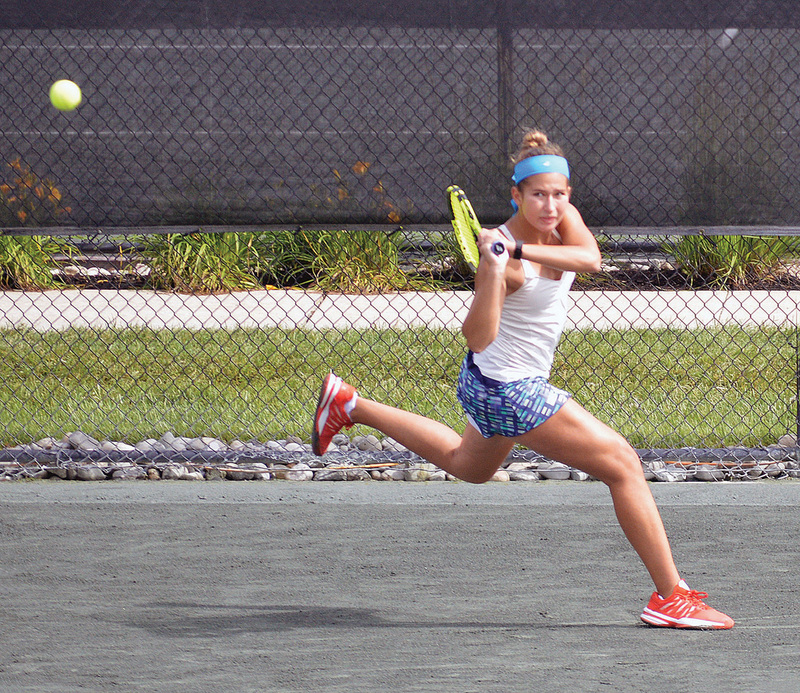 Wet weather forced the postponement of the opening day of action in the 8th Annual ResortQuest Pro Women’s Open at Sea Colony Tennis. The tournament is a $25,000 USTA Pro Circuit clay-court event. Thanks to the yeoman efforts of the Sea Colony grounds crew, roughly a dozen courts were readied for Monday’s action, which featured 38 first- and second-round qualifying singles matches. More than nine hours of tennis was played on Monday, with 54 players from 11 countries participating. A dozen of the 16 seeded players moved on to Tuesday’s qualifying action, with American Rachel Lim taking down the highest seed so far. No. 7 seed Zoe Kruger of South Africa fell to Lim, 6-3, 6-4. American Nicole Hammond bested No. 9 seed Catherine Leduc of Canada, 1-6, 6-2, 6-3. In a battle of Americans, No. 13 seed Andie K. Daniell dropped a straight-set match to Jessica Livianu, 6-4, 7-6, with four tie-breakers. No. 16 seed Joelle Kissell also went home early after dropping a nearly three-hour, three-set contest to Alycia Parks, 3-6, 6-2, 6-4. During Tuesday’s action, the final eight singles qualifying matches were contested, with the winners earning spots in the main draw for Wednesday (after Coastal Point press time). American and top seed Shelby Talcott defeated countrywoman Nicole Hammond, 6-1, 6-2. Second seed Gabriela Talaba was a straight-sets winner over Alycia Parks, 7-5, 6-0. American Elysia Bolton, the No. 10 seed, took down Mexico’s MariaJose Portillo Ramirez, 7-6 (five tie-breakers), 6-3. A pair of seeded Americans squared off, as fifth-seed Rasheeda McAdoo got by 11th-seed Gail Brodsky, 6-3, 7-5. American Amy Zhu, the 12th-seed, beat Rachel Lim, 6-4, 6-4. The biggest upset of Tuesday’s action came from 14-seed Salome Devidse, as she defeated No. 3 seeded American Kana Daniel, 5-7, 7-6 (8), 7-5. The 11 countries represented in the tournament this week include the United States, Canada, Mexico, France, Italy, the Netherlands, Romania, Bulgaria, Georgia, South Africa and Australia. Admission is free for spectators, and the public is being invited to watch all weekend long. To follow the action at the ResortQuest Pro Women’s Open at Sea Colony, check out their website at SeaColonyTennis.net/pwo, or find results and information on Facebook (/seacolonytennis) or on Twitter (@seacolonytennis) with the hashtag #ProSC.